Come join Holy Family for the holiest time of the year – the Paschal Triduum. 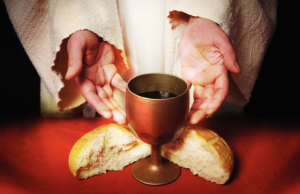 It begins Thursday night with the Mass of the Lord's Supper on Thursdsay, April 18, at 7:30 p.m.
At this Mass, the clergy will re-enact Jesus' washing of the apostles' feet, calling us to do as Jesus would do. The oils from the Chrism Mass will be processed in during Mass. The Mass ends with the Eucharist being processed into the St. Patrick Hall for adoration of the Blessed Sacrament until midnight. Night prayer from the Liturgy of the Hours starts at 11:40 p.m., capping the period of adoration before the Eucharist is placed in repose.